If you're in Tampa tonight, be sure to look up! The SunTrust Building in downtown Tampa will be lit in rainbow colors in recognition of Equality Florida's Tampa Gala. So far, more than 300 people have bought tickets or reserved a sponsor's pass at Tampa's most significant LGBT political/social event of the year. Bob Buckhorn and Kathy Castor are among our honorary hosts. They'll be there. 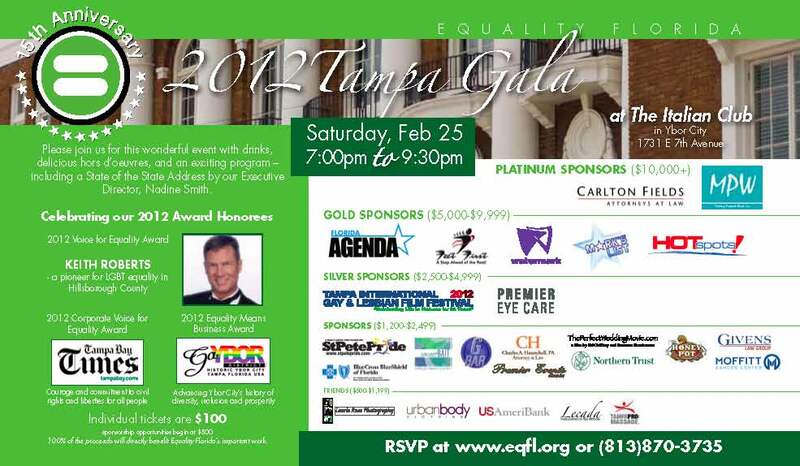 Paul Tash, CEO of the newly renamed Tampa Bay Times, will be accepting our Corporate Voice of Equality Award. Keith Roberts will receive an Individual Voice of Equality Award. And the GaYBOR Coalition will receive our first Equality Means Business Award. We'll have great conversation, free drinks and hors d'oeuvres, and a short program. The event is being held at The Italian Club - 1731 E 7th Ave in Ybor City. Tickets are $100 and can be purchased at the door.